Roots 2 began with a need for more storage space . . . I knew that Roots 2 was going to be a multiple-year project when I started it, but I did not realize it was going to take so many years to complete. No, I did not work on Roots 2 all the time – – so many distractions, so many interesting things to do and see, so little time. There are, after all, only so many hours in the day, and at my age ( 78 years, and counting) I must carefully and selectively allocate my time and energy to things that are most important. Be that as it may, here is a brief account of how Roots 2 came to be . . . . .
About six years ago, we needed more storage space, and decided to remove a loquat tree and place a concrete pad where the tree once stood to create a place for a storage shed. The tree had faithfully provided fruit for us during several years. It was so sad to remove a tree that had provided us with so much delicious fruit. After thinking it over for a while, I decided to preserve much of the trunk and the roots for an <undetermined> woodwork project. After topping the tree and soaking then ground thoroughly in order to make the digging easier, the excavation began. 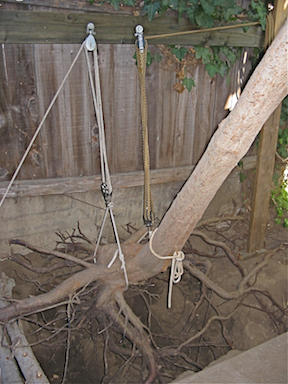 Excavating a sizable tree is no easy task, especially if one wants to preserve the root system as well as the above ground “timber”. Think of an archeology dig where everything must be uncovered VERY carefully in order to avoid damaging the object being dug out of the ground. 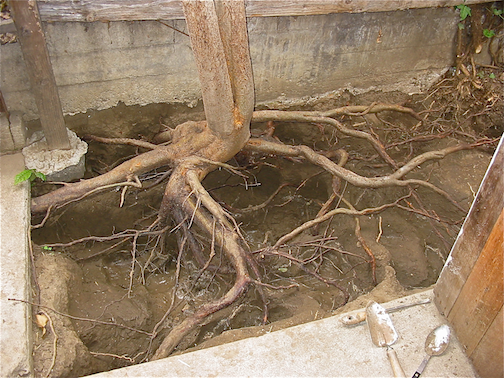 About a year, or so, after starting the excavation, the stump and roots were almost free of the ground. In the lower right-hand corner of the photo, you can see the two main tools used for this dig. Finally, Roots 2 was free, and ready for moving to a place suitable for cleaning, drying, and bark removal. A tree this sized weighs quite a bit, and I had to use a couple of block & tackle rigs to lift it from it’s former resting place. 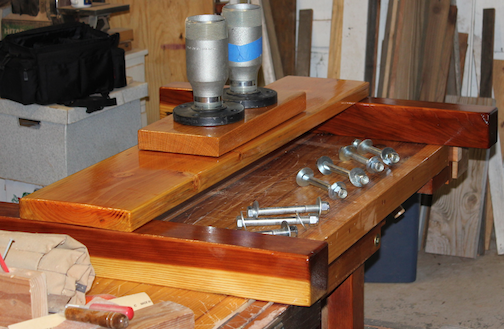 Next, I made a small platform with wheels so that I could easily move Roots 2 to the place where the preparation and varnishing would take place. Cleaning and bark stripping, like the excavation, was a tedious, time-consuming process that required about two years to complete, working on the project as time and energy allowed. 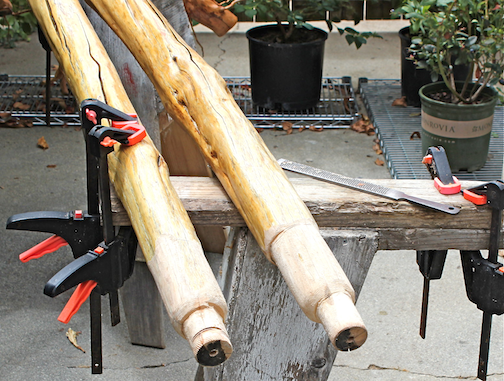 A variety of tools were used for bark removal, including scrapers, gouges, rasps of various sizes, sandpaper, and a pocket knife. 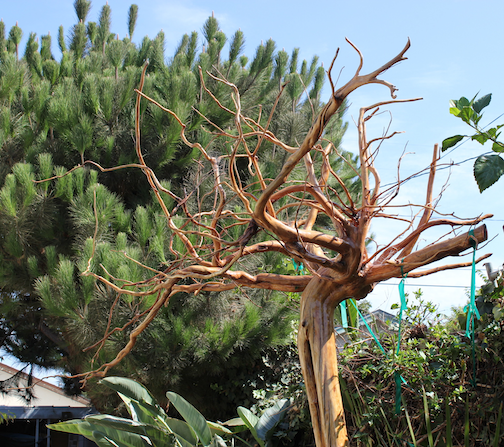 Great care was taken to preserve small details, bumps, and dimples in the root structure. After the stripping was completed, a bit of sanding to smooth things out was requred. 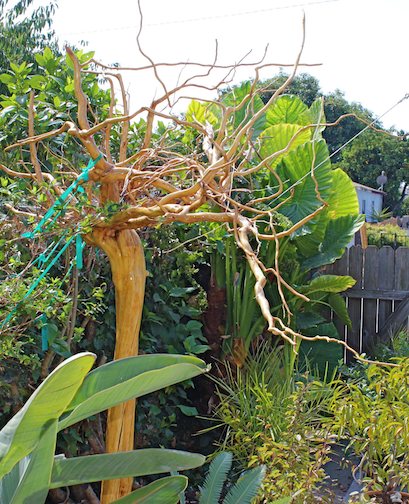 Once again, this was a rather tedious process in order to prevent damage to the roots – – particularly the tiny ones that has managed to survive the preparation ordeal thus far. Varnishing was a comparatively simple and easy task, compared to what had gone before. 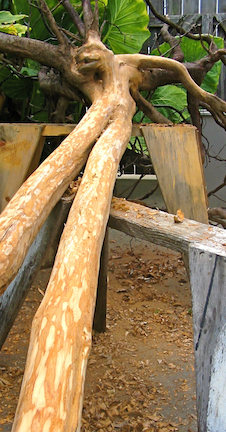 I used the finest marine grade spar varnish because Roots 2 would serve as a trellis for a honeysuckle vine when it was installed in it’s final resting place. 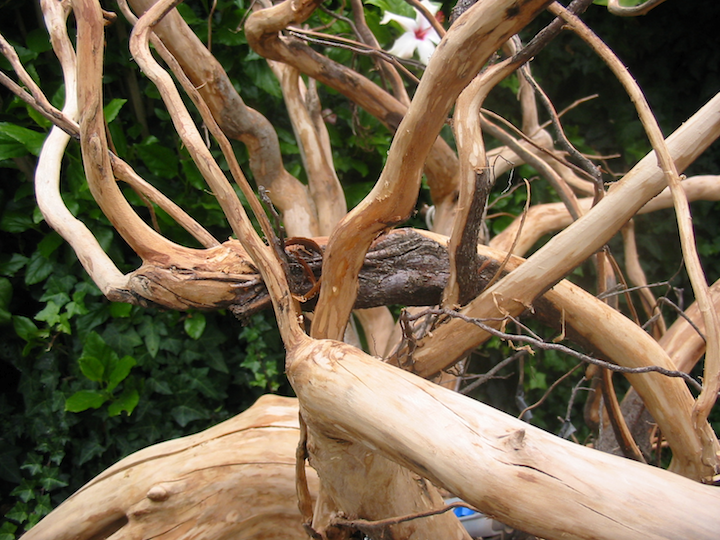 The trunk(s) can be re-varnished, but the roots can never again be refinished once the honeysuckle has overgrown them. Meanwhile, boots for Roots 2, and a base to set the whole thing upon had to be constructed. Virtually all of this building process, including the sanding and varnishing, took place in the workshop. 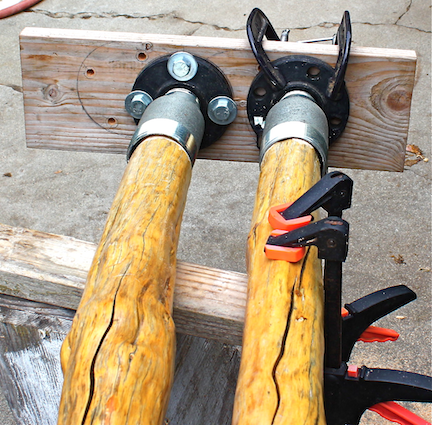 The “boots” had to be fitted in place in order to insure they would fit properly when attached to the base. The boots were fitted individually to each of the trunks to insure a reasonable tight fit, and attached to a “trial base”. This trial base was required in order determine the exact pattern for the holes in the final base assembly. The base, shown ready for final assembly, below, was built inside the workshop, then taken outside to be attached to Roots 2. Final assembly and attachment of the base to Roots 2 took place on an old driveway, with the final resting place shown in the background. The blue masking tape is there to insure everything has been properly oriented before moving Roots 2 to it’s final resting place. Moving into place was no problem at all, and took only a few minutes. 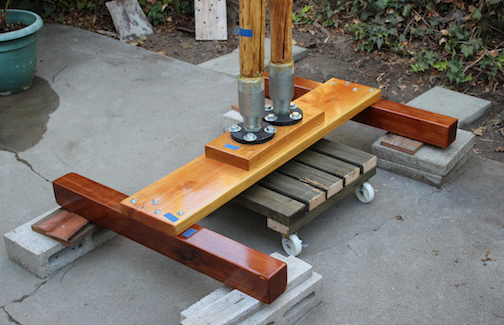 Notice that the platform on which Roots 2 is resting has rollers, which make it very easy to move the assembly about. The platform will serve as a base for a large potted plant once Roots is firmly in place. I have no photo showing ALL of Roots 2 (including the base) in place because none of my attempts to get such a photo have producing anything suitable for prime time viewing. The green plastic tape streaming down from the left side of Roots 2 is there to provide a pathway for the honeysuckle to reach out and cover the top. The honeysuckle blossoms will be an attraction to hummingbirds, once the top is covered and in bloom – which will require at at least a couple of years. Hmm m m – maybe if I climb up to the rooftop I could get a photo of the whole thing ? 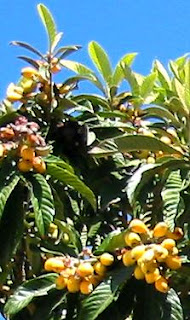 This entry was posted in Home and Garden and tagged Home and Garden, loquat, plants, Roots, Roots 2, spar varnish, Woodwork. Bookmark the permalink.